What rules have changed for 2011? 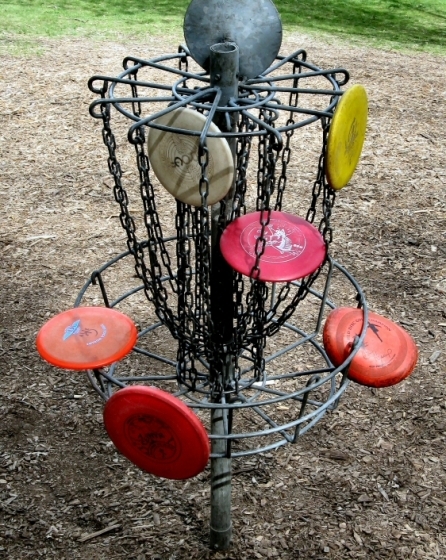 The PDGA Rules Committee has modified several rules that go into effect January 1, 2011. The full text of the updated rules is online here: PDGA Rules 2011 Renewing and new PDGA members will receive a copy of the new combined 2011 PDGA Competition and Rulebook in their member packets. These changes for holing out mean calls for the �putting tree� photo shown below that was in the Rules School story on Interference need to be updated. Under the old rules, only the yellow disc would not have been considered holed out when the player removed it. Under 2011 rules, the white and red discs are holed out (IN). The yellow disc as before and the orange disc hanging on the nub outside the basket are NOT IN. The orange disc balancing on the rim, which used to be considered IN, is now considered OUT in the 2011 rules because the disc is not entirely supported by the pole, inner wall or bottom of the basket. The orange wedgie is now NOT IN if the group observed it wedge from the outside. If the group did not see it or watched it clear the top basket wire then wedge on the way out, it is IN. While changing the rule name seems cosmetic, it eliminates a potential double penalty that might occur when the 2m rule was in force and provides an alternate option for missed mandatories. Under the new Optional Rethrow rule, players who miss a mandatory now have the option to rethrow from their original lie instead of the Mando Drop Zone if they prefer. Essentially, the Optional Rethrow means players may rethrow from their original lie if their disc lands in any of the disc golf penalty hazards � OB, Missed Mando, above 2m and Lost (which already is handled this way) � and receive a 1-throw penalty. Of course just like the old Unplayable Lie rule, a player may choose this Optional Rethrow penalty without permission from the group no matter where their disc lands whether inbounds or a hazard location. Although not directly part of the Optional Rethrow rule, the new rule for Provisional Throws clarifies that a player may not later declare a throw they first called a Provisional as their Optional Rethrow. The player must go back and make an optional rethrow (if that's what they decided is the best option) and not use that provisional throw after seeing the results of the provisional and the original throw. Casual obstacles as in current rules � casual water, loose leaves or debris, broken branches no longer connected to a tree, motor vehicles, harmful insects or animals, players' equipment, people, or any item or area specifically designated by the director before the round � can be moved if they are in the player�s stance or run-up, even if part of the item like a branch is in front of the lie. If the casual item can�t be moved, like water or a bee hive, the player may take free relief up to 5m back on the line of play like before. If players require additional relief beyond 5m, they may invoke either the new Optional Relief rule (803.05C) and go back on the line of play as far as they desire with a one-throw penalty. Or, decide to declare the Optional Rethrow discussed previously and return to their original lie and throw again with a one-throw penalty. The �disc below playing surface� phrase has been moved from the Rules Q&A and added to this rule. This applies to a disc located down on a �non-playing surface� that players would not be able to play from such as a crack in the ground. The �disc below playing surface� section does not apply to a disc resting on or above a playing surface where another playing surface like a bridge might also pass above the disc. It�s possible that moving vertically from the front edge of the disc closest to the target up to the level playing surface might be a point in space. If so, then mark the lie on the playing surface near the edge of the crack on the line of play no closer to the target. And before anyone else calls the optional rethrow a "mulligan", you need to count the throw that got you there, AND take a penalty throw, AND go back to your previous lie. Here's another rule that takes the fun out of the game. CFDG, #15. You doink the basket from 8', your disc rolls down the hill into the rocks and behind a tree. Your lie requires you to play twister just to lay up. But why would you? You can just play the shot over instead of playing it from where you put it. Same score, and so lame. I can see this rule getting used alot at CF. Take #6. You throw a drive up the middle but short. Your approach hits a tree on the left and rolls way down to the bottom of the hill. Its going to take at least 2-3 just to get back up to the fairway. Instead, you can now take a 1 throw penalty and rethrow from the fairway. Using the rule you are 5. Same result or better, without the stress of having to try and throw out of jail. I kind of get it but not sure its the best way to go.